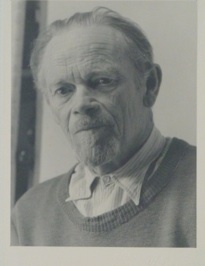 Victor M. Gordon, a US Army sergeant stationed in Würzburg, Germany, at the end of World War II, began purchasing and collecting woodcuts representing the entire output of local artist Albert Banska. Many of these exquisite and highly crafted prints adorned the Gordon home in New Haven, Connecticut. His children and grandchildren grew to appreciate them as well. With his passing, his children thought Banska’s works should have a wider audience. A few years before he died, Gordon documented his relationship with Banska in a memoir published here, adding a touching note to this uniquely comprehensive collection of prints and opening a window to everyday conditions in Occupied Germany. Born in New Haven, CT, and working there as an attorney when he was drafted into the Army at the age of 33, Gordon was Jewish and fluent in German, with a deep love of the language, its literature and culture. In 1944, when he left for war, Victor was married to Naomi B. Gordon. They already had two children, with a third on the way, born in January, 1945. A fourth child was born in 1952.